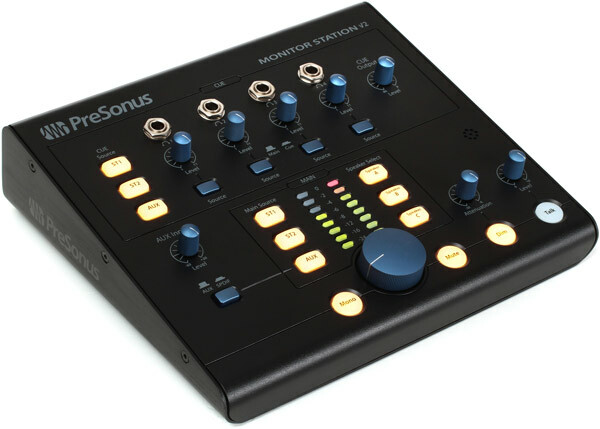 Presonus Monitor Station V2 : Presonus gives you a compact, effective unit to control your monitors and headphone mixes from one source. The Monitor Station includes controls for selecting speakers, main outs, and cue sources, with a handy central level meter. You can switch between three sets of speakers to audition mixes. Four headphone outs with individual level controls let you route cue mixes to performers while routing a main mix to your control room speakers. The setup is a snap to customize, and easy-to-read, well-lit selector buttons make it easy to use the Monitor Station in any studio lighting situation. You can also choose between a built-in talkback mic, or plug in your own via an XLR input. The Monitor Station is a value packed studio essential!